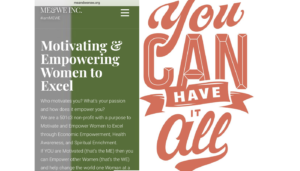 You Can Have It All – ME&WE Inc.
As little girls we are taught a lot that may hinder our belief that we can have it all. You were set up. Let me tell you the greatest lie ever told… “And they lived happily ever after!” Yes, Walt Disney did that. Disney has made billions on the heart strings and the consciousness of women as well as little girls every where. And for the longest time this really messed with me. I was irate at Walt and really wanted a refund on every doll and outfit my mother had ever gotten me over the years. Let’s just say, the buy in to the “happily ever after” was literal. Disney lied! Straight up. Because when life happens, and it does…when things go array…and they will. You find yourself off balance. You say to yourself… “I thought I was supposed to live happily ever after”! But life is not fair and what you believe will shape your future. We as women still ask ourselves “can we have it all”, do you want it all, and what exactly is it all? We as women must deal with the pretext of what we have been told and seen over the years as well as the context of our current situation. Applying some basic questions and beliefs will allow you to not just have it all…but get what you really want in life. So here is the killing part. I had to ask God to forgive me and I ceremoniously apologized to dear old Walt Disney because he said one word that gave us all a disclaimer, and we missed it… “AFTER”! Just think about every queen, princess or damsel in distress and what actually happened. She lived happily ever…AFTER! After life had demonstrated how truly unfair and unscrupulous it can be. The AFTER is what we as women should believe in. Case and point: Cinderella got her prince and lived happily ever after…after being in a dysfunctional family with two ugly ungrateful step-sisters and a bitchy step-mother who locked her up and made her clean 24-7. Only to be saved by a fairy good mother, a few critters and an unbelieveable magic that had an expiration time. Ok how about Snow White who lived happily ever after with her prince charming… after she was illegally drugged by an evil step-mother (do you see a trend), left for dead in the woods, only to be taken care of by seven little men (Disney had a precarious mind…but would have been great for Lifetime writers) nonetheless she was saved by a kiss and the spell was broken. Ok so how about Tianna, finally a black princess. She is a young hard working entrepreneur who’s big heart to help an entitled man, I mean a prince, got her into more trouble than it was probably worth (sound familiar). She gets turned into an cold-blooded amphibian (i.e. the frog before she is princess) and has to deal with a lot of black magic and some crazy people down the bayou. She becomes a princess who has a business, but keeps it on the side because she must be present first for her prince and the kingdom. And oh by the way, she lived happily ever after. So did you catch it? AFTER! No matter what you have been through, going through or will go through…You can still have it all! It may not be picture perfect, with a Disney flare but it is possible. You can have it all after the hurt, after the drama, the after the betrayal and after the pain. Let me be clear, the after may be in a relationship, on your job or profession or with yourself, family or life. Yes life does happen but know there can be a happily ever after. But it depends on what you believer in (not fairytales) and what you tell yourself. It also depends on what you want in life. If you are focused on the past, you can’t see the now, and you definitely will not be able to see the future. LOOK AT YOUR CORE BELIEFS, WHY YOU THINK THE WAY YOU DO?